This post first appeared on the Biodiversity Heritage Library blog. Rösel von Rosenhof, August Johann. Historia naturalis ranarum nostratium. 1758. Contributed in BHL from Smithsonian Libraries. 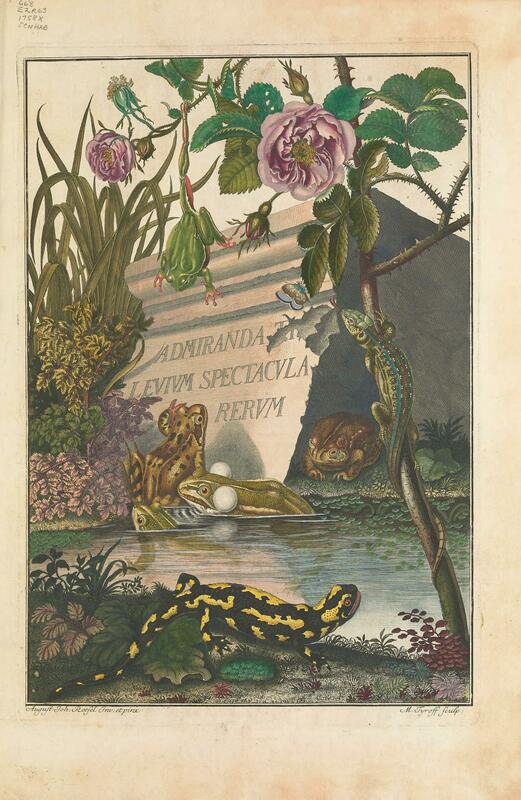 Historia naturalis ranarum nostratium has been described as one of the most beautiful works devoted to frogs and amphibians. 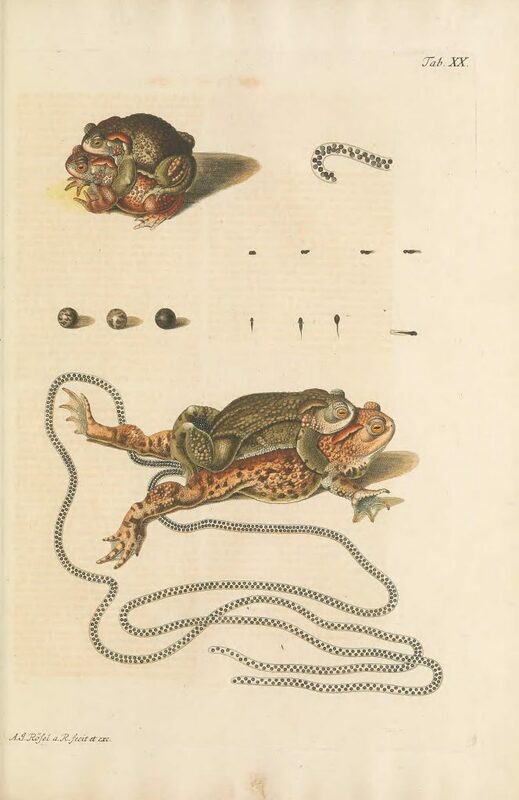 The work of German artist and naturalist August Johann Rösel von Rosenhof, Historia naturalis ranarum nostratium describes the natural history of all then-known frogs and toads indigenous to the Nuremberg region in Germany. The title is noteworthy first for the extensive, accurate information in the text, printed in two columns in both German and Latin. As Darrel Frost, a curator in the Herpetology Department in the Division of Vertebrate Zoology at the American Museum of Natural History, wrote in his essay on the book for Natural Histories, “Rösel’s volume on German frogs represents in a very real sense the beginning of accurate life-history observation in amphibians” (Frost 2012, 38). The work is equally (if not more) renowned for its illustrations. The twenty-four folio, hand-colored copper engravings portray habitats, anatomy, reproductive behavior, and larval development stages in intricate detail. The quality of the artwork is not surprising given Rösel’s artistic background. Johann Rösel von Rosenhof was born in 1705 to a noble Austrian family near Arnstadt in the German principality of Arnstadt-Schwarzburg. Orphaned at a young age, Rösel was sent for training to his uncle, Wilhelm Rösel, an animal and landscape painter, after he showed artistic talent. He eventually became a painter of portraits and miniatures to the Danish Court in Copenhagen before returning to Nuremberg and earning his living as a painter. Rösel’s passion for natural history was ignited by the work of Maria Sibylla Merian, a German-born naturalist and illustrator who is recognized as one of the most significant contributors to the field of entomology. Her Metamorphosis Insectorum Surinamensium (1705) depicted the full life cycles of many Suriname insects. Merian was able to portray this life history information because she drew her subjects from life in their natural environments. Most naturalists of the day illustrated species from dead, preserved specimens, which contributed to a lack of knowledge about the true life cycle and origin of insects. Maria also portrayed the host plant for the species she studied and even illustrated the damage the insects left on the plants. Rösel von Rosenhof, August Johann. Der monathlich-herausgegebenen Insecten-Belustigung. v. 4 (1761). Contributed in BHL from the Naturalis Biodiversity Center. Merian’s work inspired Rösel to study and produce a similar work on German insects. His interest in the natural world also grew to include amphibians and reptiles, and he used his leisure time to collect insect and amphibian eggs and larvae to observe their development. 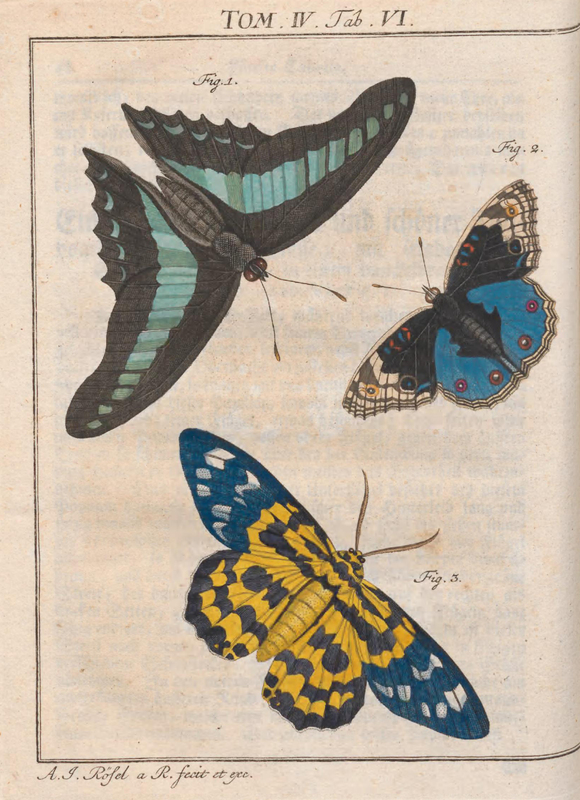 The first part of his first natural history publication, Der monatlich-herausgegebenen Insecten-Belustigung, was published in 1740. Four additional parts appeared over the years, with the final one being published posthumously in 1761. Because of this publication, a copy of which has been contributed in BHL from the Naturalis Biodiversity Center, Rösel is known as one of the fathers of German entomology. This illustration became the type of Bufo calamita (now Epidalea calamita). Rösel von Rosenhof, August Johann. Historia naturalis ranarum nostratium. 1758. Contributed in BHL from Smithsonian Libraries. In 1753, Rösel published the first part of his Historia naturalis ranarum nostratium. Completed in 1758, the work is a scientific and artistic marvel, and several of the illustrated frogs, such as Bufo calamita (now Epidalea calamita) and Bufo fuscus (now Pelobates fuscus), became the types for their species. 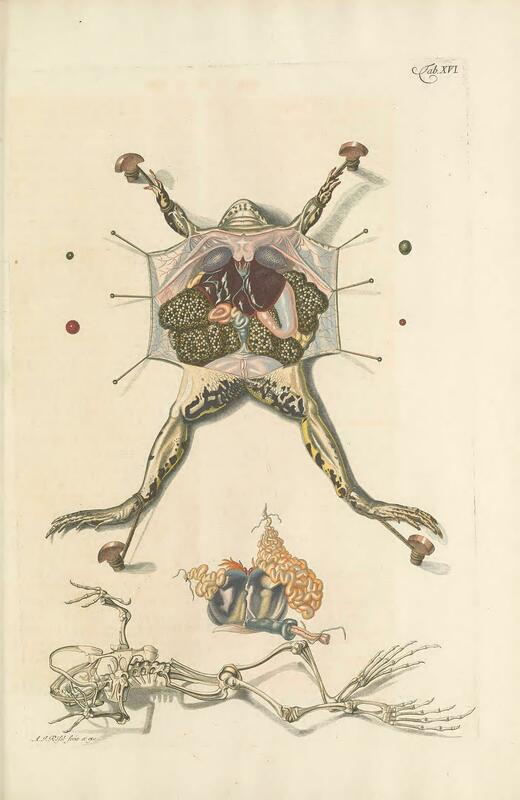 Thanks to the Smithsonian Libraries, everyone in the world can appreciate Rösel’s scientific and artistic contributions to the natural history of German frogs. The Libraries’ copy of Historia naturalis ranarum nostratium, housed in its Joseph F. Cullman 3rd Library of rare books, has recently been digitized for BHL. 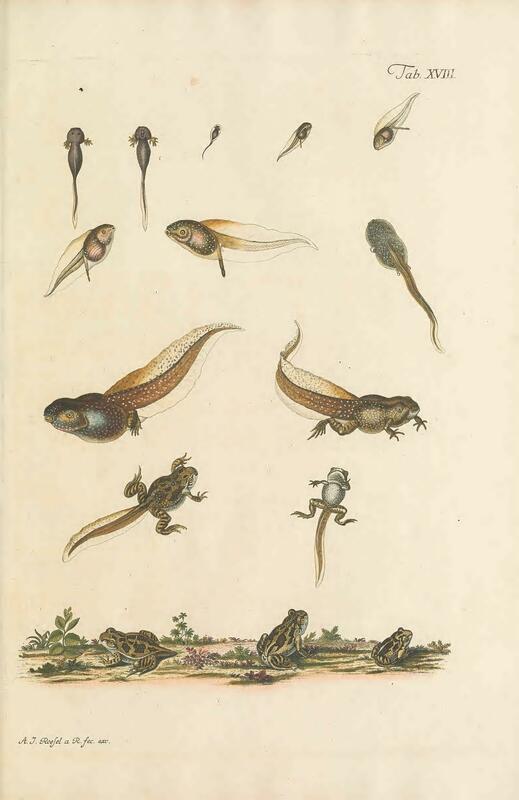 As Frost outlines in his essay, Rösel intended to produce a similar work for lizards and salamanders, but sadly was not able to complete it, as he died unexpectedly on March 27, 1759. Through his natural history publications, Rösel’s scientific legacy lives on and is accessible to everyone through the Biodiversity Heritage Library thanks to the Naturalis Biodiversity Center and Smithsonian Libraries. Frost, Darrel. 2012. 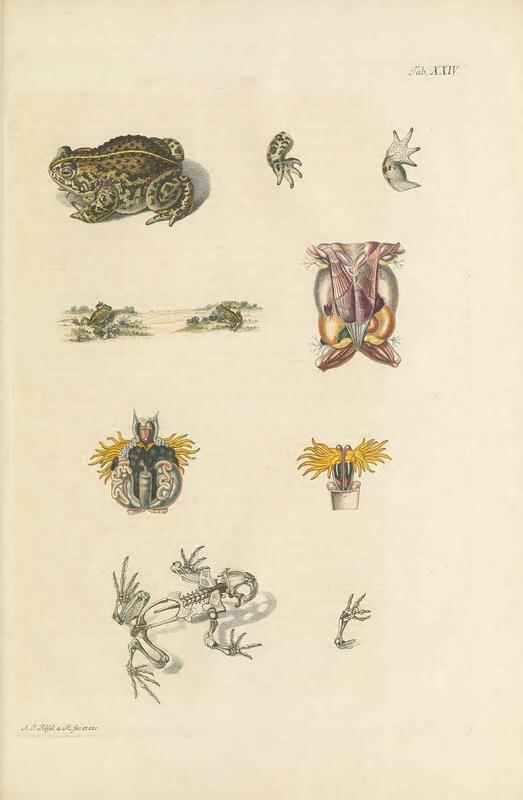 “Rösel von Rosenhof and His Natural History of Frogs.” In T. Baione (Ed. ), Natural Histories: Extraordinary Rare Book Selections from the American Museum of Natural History Library (pp. 37-38). New York: Sterling Publishing.